We’ve all seen the commercial numerous times. The message is very clear and easy to remember: “There are over 400,000 NCAA student-athletes, and most of them will go pro in something other than sports.” Clearly, the odds of making it to the NBA are stacked heavily against High School basketball players. Every year there are about 545,844 High School Basketball Players in the United States. Of those approximately 17,500 will become NCAA student basketball players. Each year about 48 NCAA basketball student-athletes are drafted into the NBA. Making it to the “league” is a real long-shot. Some young men focus so intently on achieving their NBA hoop dreams, they lose sight of all the benefits of a free education. Others are keenly aware of the opportunities afforded to them as student-athletes and take steps to ensure their vocational and financial future while still wearing the college uniform. Evan Maschmeyer grew up a Hoosier. He was reared and educated in Jeffersonville, Indiana. Jeff, as the locals call it sits directly across the Ohio River to the north of basketball mad Louisville, Kentucky. A small town with a population of 45,000, Jefferson is about 60 miles southeast of French Lick, the hometown of American basketball icon Larry Bird. 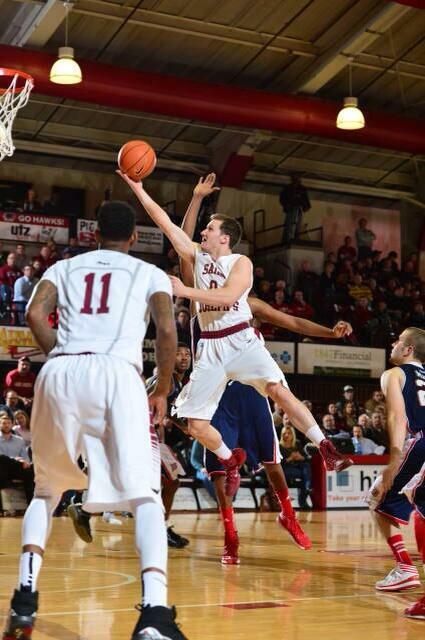 Entering Saint Joseph’s in the Fall of 2011, Evan brought some serious basketball credentials. He was part of the 2009-10 Red Devils team that was a win away from a Class 4A state championship. Among numerous other accolades, Maschmeyer was an Indiana Junior All-Star and News and Tribune All-Area team member. He was a highly regarded player in the basketball mad Hoosier state. Upon arriving on Hawkhill he immediately found himself competing with Carl “Tay” Jones and Langston Galloway for playing time. These two are 4th and 2nd, respectively, on the all-time scoring list at Saint Joseph’s. Although he has appeared in a majority of games over his 3-year career season, Evan has found it difficult to earn sustained minutes in such a talented backcourt. However, unlike 400-500 other basketball student-athletes that transfer every year, Evan decided to focus his energies on helping his team when the opportunity presented itself and leveraging his free education to ensure a viable career as a financial “professional” once his playing days are over. After his sophomore year, he completed an internship with Haverford Trust, Co. in Radnor, PA. This summer, after his junior year, he will serve an internship with J.P. Morgan in Chicago. Evan’s experience with Haverford Trust combined with an exceptional academic record while maintaining a double Finance/Economics major made him a competitive candidate for the prestigious internship. The fact that he achieved this success while fulfilling his obligations a member of the Atlantic 10 Championship St. Joe’s team is even more impressive. J.P. Morgan’s summer internships are in highly competitive for many compelling reasons. First, Evan will work with smart and energetic professionals on real, challenging projects at one of the world’s top financial services firm. Second, he will have the chance to discover first-hand what areas of their business best suit his talents and interests. Third, and this is the big one, J. P. Morgan hires a majority of their full-time Analysts from the Summer Intern Analyst class. This is the best “move” I have seen a college basketball player make this year. J.P. Morgan employs more than 70,000 people globally, and the firm has assets of $2.3 trillion. They have offices in more than 50 countries and clients in more than 100 countries around the world — and as a testament to their global platform and leadership, lead the industry in most markets in which we operate. Founded in 1799 in the United States, J.P. Morgan is truly a global organization. Their roots in Europe date back to 1838, and They’ve been in Asia since 1872. Phil Martelli, Geoff Arnold, Mark Bass and Dave Duda unanimously agree that Evan is destined for success. I am an Evan Maschmeyer fan. I look forward to having Evan interact with other young ballers. He is the epitome of what a collegiate student-athlete should be. Use the game, don’t let the game use you! As they say… the Hawk will NEVER die!